Atletico Madrid are one side that teams find very hard to score against. The superb backline quartet of Juanfran, Diego Godin, Jose Gimenez and Miranda have just been outstanding in their European outings and as a result Los Rojiblancos have conceded just three in the eight games they have played in the UEFA Champions League so far this season. Although they let opponents few opportunities to score, the midfield area has been a source of concern with the aging duo of Gabi and Tiago getting outrun by younger and quicker players.The extremely fluid and speedy Antoine Griezmann on the wing sometimes finds himself running out of support upfront and miss out on scoring opportunities. 2015 begun well for Atletico but sometime during March their form took a beating when they were held to three consecutive draws by minions thus slipping to the fourth position in the La Liga standings. But they seemed to have regained their composure and made up for the lapse having recoverd to the 3rd spot on the back of some good matches. Los Rojiblancos don't seem to be out of the woods yet as was evident in Saturday's La Liga clash with Malaga where they somehow managed to scrape through a 2-2 draw thanks to Griezmann's goals. For Real Madrid, the attacking trio of Ronaldo-Benzema-Bale need to fire. The recent 9-1 win may be a sign of Los Blancos finding their old mojo back. But the key to this is the return of a fully fit Luka Modric, who is such a pivotal figure in the midfield and may just provide that balance and fluidity missing in the Spanish giant's games of late. 2015 has been a dismal year for the club. Four La Liga defeats this year have seen them being pushed to second place behind arch-rivals Barcelona. The Los Blancos backline have been very susceptible during their European campaign this time and much of that was manifest in a 3-4 2nd leg loss to German club Schalke04. A 2-0 away lead somehow saved Los Blancos the blushes and they made it to the last 8 by the skin of their teeth. Iker Casillas's performance between the posts came under immense fire. Real will be heavily banking on Ronaldo's goal-scoring skills at the Vicente Claderon on Tuesday. In fact it was his double strike that saved the day for Los Blancos against Schalke04 at Bernabeu last month. The Real Madrid talisman got his 38th La Liga goal in the match against Eibar on Saturday. This takes his tally to a staggering 49 goals from 43 games this season. Although Los Blancos steam-rolled opponents in the last three La Liga matches with scores reading like 9-1, 2-0 and 3-0, the teams were all minions. Granada are bottom-scrapers, Eibar is 14th and in the match against 10th-placed Rayo Vallecano on Wednesday, Los Blancos seemed to have gone into their shell once more, not getting a goal for over an hour of play before winning 2-0. The European title-holders have made it to the semi-finals of the Champions Cup on all the previous four occasions.The ten-time winners seem to be least prepared this time around. But Ronaldo's recent goal-scoring spree (seven from just three games) may have just injected the will to win into the team. Atletico have not lost a single match against their Madrid rivals since the Champions Cup loss in the finals at Wembley last year. At home at the Vincente Calderon their record is even more daunting. Los Rojiblancos have won 21 out of the 23 European fixtures they have figured in at this venue and are chasing a 5th successive home win. These two factors give Los Rojiblancos an edge going into Tusesday night's clash. This is their 15th quarter-final appearance in the Champions Cup and will be vying for a semi-final spot for the fifth time. On paper, Real Madrid could be the best team in the world but they are functioning much below their peak. Against a doughty and difficult opponent like Atletico they will have to be at their best. Los Rojiblancos at the moment are vulnerable at the best given their mediocre performances in the La Liga and European outings of late. 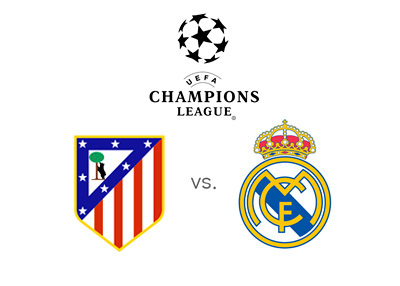 This is when a resurgent Real can be expected to hit their opponents hard on April 14 night. Bookmakers probably have in mind Real Madrid's phenomenal track record in the European championship and the tremendous depth of their talent. So, inspite of a home game advantage for their rivals and a poor head to head record in the last year, the odds are absolutely Even Stevens for the 1st leg encounter at Vincente Calderon on the 14th. Head to head statistics of these two in the last six matches.